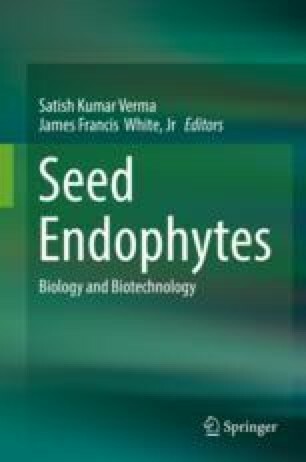 Seed endophytes play a key role in increasing plant health and growth in both managed and natural ecosystems. These can be applied in agricultural production or for the phytoremediation of pollutants. However, because of their capacity to confer plant beneficial effects, efficient colonization of the plant environment is of utmost importance. The majority of endophytes derives from the soil environment. They may migrate to the rhizosphere and subsequently the rhizoplane of their hosts before they are able to show beneficial effects. These endophytes can also penetrate plant roots, and may move to aerial plant parts. A better understanding on colonization processes has been obtained mostly by microscopic visualization as well as by analyzing the characteristics of mutants carrying disfunctional genes potentially involved in colonization. In this chapter we describe the different metagenomic approaches of seed colonization and survey the known mechanisms responsible for endophytic competence. The understanding of seed colonization processes is important to better predict how endophytes interact with seeds. The authors are grateful to the Department of Microbiology, Akal College of Basic Science, Eternal University, Himachal Pradesh, for providing the facilities and financial support.